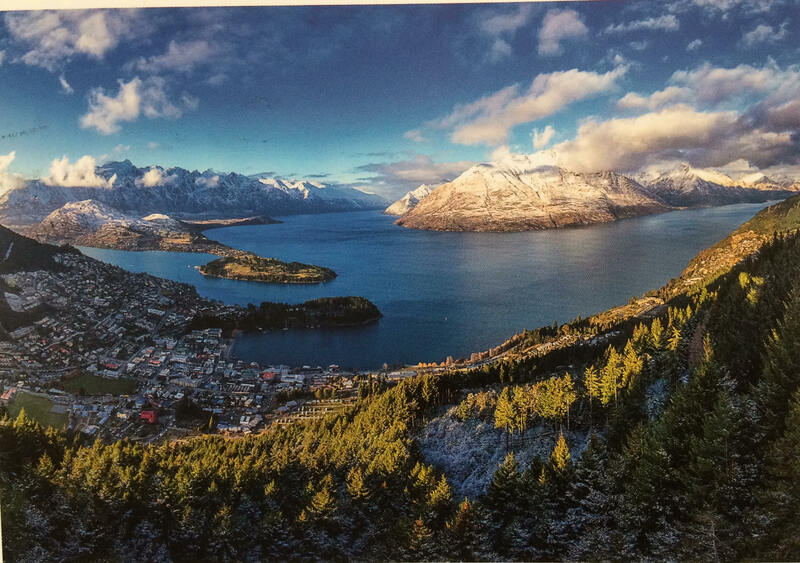 Thanks to Vicky who sent this card of winter in Queenstown, on the South Island of New Zealand. The picture shows Lake Wakatipu surrounded by the Remarkables mountain range. Māori legend tells of how the lake was formed by the slaying of a fierce giant as he slept on his bracken bed. The giant was called Matau and his bed had been set on fire by the Māori chief whose daughter the giant had kidnapped. The daughter was called Manata and she was in love with a man called Matakauri. Matakauri tried to rescue Manata, but could not untie the ropes that Matau had tied her with. However, Manata’s tears dissolved the ropes away and the pair escaped together from the giant’s lair. They married and, by all accounts, lived happily ever after. Meanwhile, Manata’s father felt the situation was unresolved and set out to kill the giant once and for all. He killed Matau by setting fire to his bracken bed in the valley between the mountains. The fire was so intense that it burned a great hollow in the valley, and melted the glaciers that surrounded it. The only thing that survives of Matau now is his heart, and as his heart continues to beat the water of the lake rises and falls by around 20cm, every half an hour. From NOAA Great Lakes Environmental Research Laboratory. Geography Cat likes the way that humans are always trying to explain things.